The Three Graces are three large prominent rock outcroppings that are in between Garibaldi and Barview along the Oregon Coast Highway. This is an excellent location to stop for a beautiful picture or to take a stroll along the beach and out onto the rocks on a low tide to explore the shallow pools of water teeming with aquatic life. There are hundreds of sea anemones attached to the rocks, starfish, little crabs and much more to see when the water is low. The Three Graces are close to the opening of Tillamook bay to the ocean and so there is usually boats passing by from the port to ocean and the occasional coast guard vessel cruising by. The tide pools are a great place to take kids that want to explore the rocks and see interesting and cool creatures. Be careful as the seaweed on the rocks further out will be slippery and the current can be swift, so it is best to not go too far out on a low tide and get back in once the tide has turned and starts coming in. I recommend getting out an hour before the low tide especially if it is a negative tide and there will be plenty to look at and the kids will want to probably get going to the next thing before the water starts coming back in from the Ocean. 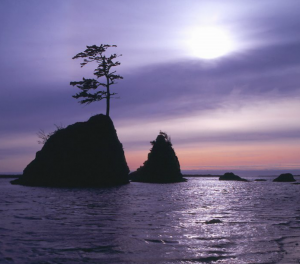 It is best to visit on a low tide so consult a tide table that you can find at most of the local stores along the coast or this web link to the tides for Garibaldi. http://tidesandcurrents.noaa.gov/noaatidepredictions/NOAATidesFacade.jsp?Stationid=9437540 However even if you are just along for a ride and want to stretch your legs there is several places to pull your car over nearby so you can get out and snap a few shots of bay and the Three Graces.